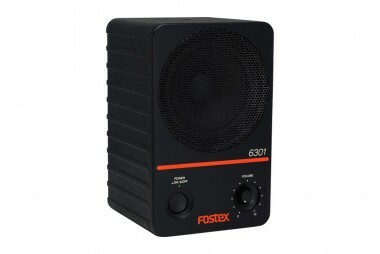 The 6301NE from Fostex is a compact monitor speaker for use in professional mobile, project, or home studios and features a 4" full-range driver powered by an integrated 20W D-class amplifier. Inputs include an electronically balanced XLR connector and a 1/4" unbalanced connector. The front panel provides a power switch and a rotary level control for easy volume adjustments. An automated protection circuitry prevents overloads and short circuits, while the die-cast aluminum enclosure is made to withstand the rigors of professional use. The 6301NE ships with a standard IEC power cord.